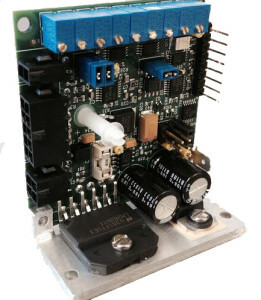 Nutfield Technology’s QuantumDrive-2000 Servo Amplifier is a compact, powerful galvanometer power supply, giving greater performance at the most cost effective price. As the smallest class-0 servo amplifier available, the QD-2000 features a single output power amp configured for maximum performance and electrical efficiency. Quiescent current is little over half of that needed for the high power push-pull QD-4000 amplifier. This galvanometer power supply leverages lower component count, higher signal-to-noise for high accuracy positioning and good temperature stability. Exceptional performance is achieved with PID servo architecture plus advanced terms for extra stability, speed and control. As with traditional systems, a notch filter is selected and tuned for each unique mirror-galvo combination to maximum system bandwidth. The result is faster, more accurate scanning. Lower cost and optimized for high volume OEM applications, the design of the QD-2000 does not sacrifice on performance or features. Onboard status LEDs provide servo status and fault indications. A diagnostic port is available for test, development and monitoring needs. Circuit features include soft start/stop operation, open circuit AGC monitor and under-voltage power supply protection. The QD-2000 also features TTL compatible remote enable and status I/O. QD-2000 Servo Amplifiers are tested and tuned with serial number matched galvanometer and mirror to customer specifications. Together with Nutfield Technology’s scanners, the QD-2000 galvanometer power supply is a laser solution that is the strongest and most affordable in its class. Note: Specifications are in degrees optical (2 x mechanical degrees) after a 2-minute warm-up period. Specifications subject to change without notice. Nutfield Technology’s QD-2000 Servo Amplifiers are tested and tuned with a matching galvanometer and mirror to custom specifications. Together, our galvo-based scanning solutions are used in countless applications from medical diagnostics and dental imaging, to laser projection and imaging, and so on.